"Birdman" took flight at the 21st annual Screen Actors Guild Awards, winning the night's top prize for outstanding ensemble in a motion picture -- even though its star, Micheal Keaton, was upset by Eddie Redmayne in the outstanding lead actor category. "This is very very exciting," Keaton said as the cast accepted the award on Sunday night. "It's the ultimate team sport, what we do for a living." The win came a day after the Alejandro Gonzalez Inarritu-helmed backstage farce earned the top award at the Producers Guild Awards -- the last seven such winners have also won best picture at the Academy Awards. Redmayne, who stars as Stephen Hawking in "The Theory of Everything," was the somewhat surprise winner in a category expected to go to Keaton for his performance as a Hollywood has-been trying to mount a comeback on Broadway. Redmayne dedicated his award -- "this very wonderful skinny man" -- to sufferers and victims of ALS. Oscar favorites Julianne Moore, Patricia Arquette and J.K. Simmons cemented their front-runner status in a ceremony that often serves as a kind of preview to the Academy Awards. Moore, widely considered the best-actress favorite, won outstanding female actor in a leading role for "Still Alice," in which she plays a professor diagnosed with early-onset Alzehimer's disease. Accepting the supporting actor award for his performance as a domineering jazz teacher in "Whiplash," Simmons thanked all 49 actors who appear in the drama. "All of us actors are supporting actors," said Simmons, a veteran character actor. "Each of us is essential, completely crucial to the story because if there's one false moment, the train comes off the rails." Arquette added the latest in a string of awards Sunday, taking the supporting actress honor for her performance, filmed over the course of 12 years. "I can't tell you what this means to me," said Arquette. "I'm a fourth-generation actor. My family has been committed to acting for over a century, through feast or famine." Sunday's show kicked things off with a pair of wins for the Netflix prison series "Orange is the New Black," honoring it as best ensemble in a comedy and naming Uzo Aduba most outstanding actress in a comedy series. Abuda won over a number of veteran stars, including Julia Louis-Dreyfus ("Veep") and Edie Falco ("Nurse Jackie"). William H. Macy took best actor in a comedy series for his role on "Shameless," a rare win for the widely admired character actor. "I've written so many great acceptance speeches that I never got to give," he said while accepting the honor. "But not tonight!" In the dramatic TV categories, Kevin Spacey won the lead actor prize for "House of Cards" and Viola Davis won as top female actor for her role on "How to Get Away with Murder." Davis thanked the producers of the legal drama "for thinking that a sexualized, messy, mysterious woman could be a 49-year-old, dark-skinned African-American woman who looks me." 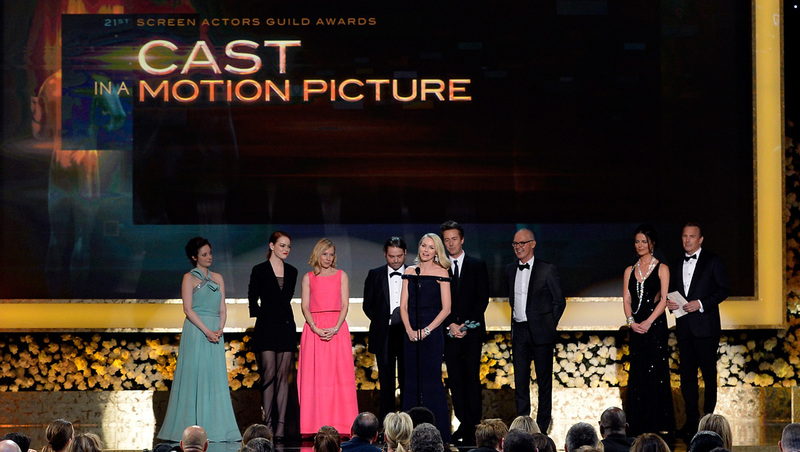 The prize for best ensemble in a drama series went to the cast of "Downton Abbey," the second time the series has won the category. Mark Ruffalo won best male actor in a TV movie or miniseries for "The Normal Heart" and Frances McDormand took the female actor category for "Olive Kitteridge," which she implored the audience to go and watch: "You can stream it, I don't know how." On Saturday night, Inarritu's "Birdman" took the top award from the Producers Guild Awards, suggesting it may be formidable competition to the perceived front-runner, Richard Linklater's "Boyhood." The last seven PGA winners have also won best picture at the Academy Awards. This year's SAG Life Achievement Award went to Debbie Reynolds, the veteran of stage and screen and, of course, "Singin' in the Rain." The award was presented by her daughter, actress Carrie Fisher. The 82-year-old Reynolds embarrassed Fisher with a story, recalling that her bun in the famous musical led her to warn her daughter ahead of playing Princess Leia in "Star Wars." "I said, 'Well, Carrie, be careful of any weird hairdos,'" said Reynolds. "So luckily George gave her two buns." She also remembered 1964's "The Unsinkable Molly Brown." "In that movie I got to sing a wonderful song 'I Ain't Down Yet,'" said Reynolds. "Well, I ain't." Because actors make up the largest portion of the Academy of Motion Pictures Arts and Sciences, the SAG Awards are considered one of the most telling Oscar previews. Individually acting winners usually mirror each other exactly, or very nearly. Last year, the top four winners -- Matthew McConaughey, Cate Blanchett, Lupita Nyong'o, Jared Leto -- all went on to win Academy Awards after first scooping up SAG statuettes. The predictive powers of the SAGs have been more checkered in matching its top award with eventual best-picture Oscar winners. In the last six years, SAG best-ensemble and Academy Award best-picture winners have lined up three times ("Argo," ''The King's Speech" and "Slumdog Millionaire"), while diverging just as often. Last year, the actors chose "American Hustle" over eventual Oscar winner "12 Years a Slave"; in 2011, they picked "The Help" over "The Artist"; and in 2009, "Inglourious Basterds" defeated "The Hurt Locker."